The daughter of an insurance agent, with childhood aspirations of being a poet, Gene Tierney signed her first movie contract at the age of nineteen. It’s hard to know if she really was much of an actress, since much of the acting was done by her placid beauty—the “face in the misty light,” as suggested by the theme song of her breakthrough Laura, where she won the title role that Hedy Lamarr and Jennifer Jones declined. 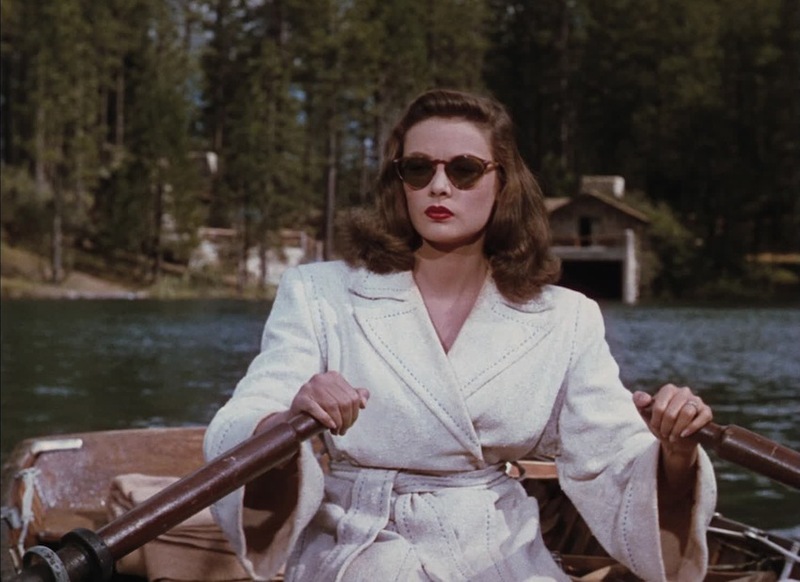 If she was the least interesting figure in Laura, that was the point, with Tierney playing a ghost in her own life, the men around her (including investigating cop Dana Andrews) yearning, each in his own crazy way, to join her on the Other Side. From its opening moments as Tierney rides the day-glo New Mexico mesas casting her father’s ashes to the wind, John Stahl’s Leave Her to Heaven is another kind of noir altogether. The most deeply berserk studio picture of the 1940s, it’s shot by Leon Shamroy in a radioactive technicolor delirious enough to make you queasy. The truth may be that if Tierney had been “better,” she wouldn’t have been as good; she might have tried too hard to make too much sense of her femme fatale who sits in a rowboat coolly watching a crippled brother-in-law drown as she does nothing, shows nothing, feels nothing. Perhaps at that moment the actress is thinking of the severely retarded daughter to whom she gave birth a year before, after a starstruck fan with measles broke quarantine at an event to raise money for World War II troops in order to meet the pregnant actress—a real-life turn so fateful and cruel that Agatha Christie later stole it for a murder mystery. In the years to come, racked by depression and roiled by dalliances with princes and future presidents (John Kennedy), Tierney was doomed to a poet’s troubled destiny after all.